George Perez. Geoff Johns. Frank Cho. John Romita, Jr. Adam Hughes. Michael Oeming. Scott Kolins. Erik Larsen. These are just a few of the many top-name creators who contributed to More Fund Comics, a star-spangled anthology benefiting the Comic Book Legal Defense Fund! An all-new Books of Lore story, entitled "Payback", written by David Napoliello & Kevin Tucker, and illustrated by the Fillbach Brothers. An all-new Forty Winks story, entitled "Good Morning! ", written by Vince Sneed and illustrated by John Peters. An all-new Buzzboy story, entitled "Buzz of a Cheeseburger", written and illustrated by John Gallager. PLUS...this book features a stunning Hulk cover by George Pérez! More Fund Comcis contains stories, as well as pin-ups in a special "The CBLDF Sketchbook" section featuring a glimpse into the sketchbooks of some of comic's hottest artists. Also, included are the first ever appearances of new creations by some of the industry's top artists, such as — Mice Templar by Mike Oeming (Powers), Marc of the Vampires by Neil Vokes (Superman Adventures), Frankenstein Mobster by Mark Wheatley (Hammer of the Gods), plus the unveiling of a Super Secret Project by Frank Cho (Liberty Meadows) and Scott Kurtz (PvP)! But that's just the beginning! 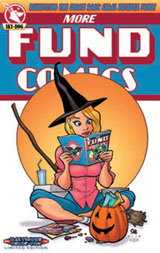 More Fund Comics includes work by such luminaries as Mike Wieringo, Adam Hughes, Jerry Ordway, Erik Larsen, Greg Horn, J. Scott Campbell, J. Bone , Scott Morse, Geoff Johns, Stan Sakai, and many, many more! 144 pages; black & white interior with full-color cover. ALL AGES. For a complete list of contributors, as well as a preview of some of the artwork and stories appearing in the book, check out the Sky Dog Comics website at: www.skydogcomics.com! 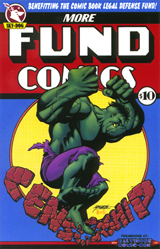 This special edition of More Fund Comics was made available only at the Baltimore Comic-Con on September 20-21, 2003, and is limited to only 1,000 copies. MORE FUND COMICS is copyright © and trademark  2003 Sky Dog Comics.